This was an especially significant day for the host, LDS singer and actor Alex Boye, as it was his first Independence Day as a U.S. citizen. Originally born in London, England, to Nigerian parents, Boye was sworn in as a citizen on Feb. 22, 2012, at the Rose Wagner Theatre. The show began with the audience singing the national anthem. During the last few measures, four F-16 jets from Hill Air Force Base flew over the stadium, a tradition that has been going on for more than 30 years. The pilots came from the 416th Fighter Wing unit, the only Air Force Reserve unit in Utah. 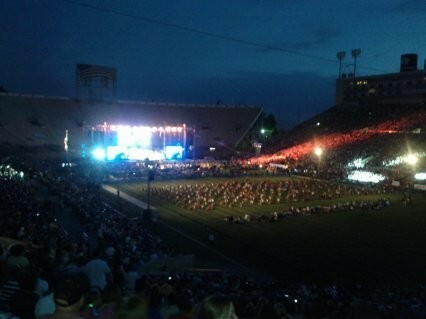 After a short dance number from the Stadium of Fire dancers, country music singer Scotty McCreery took the stage. McCreery won the 10th season of American Idol and has released an album entitled Clear as Day in 2011. McCreery, though slender, has an unexpectedly deep voice and a Kenny Chesney-esque twang that rocked the stadium. After the talent competition ended, the lights went down, as the moment everyone had been waiting for arrived. 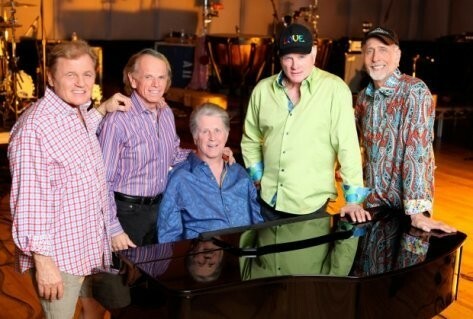 The five members of the Beach Boys took the stage wearing Hawaiian shirts and cargo shorts, styling the Southern California lifestyle that had made them famous decades ago. Their stop at the Stadium of Fire was part of their 50th Anniversary Tour, and despite being between the ages of 63 and 71, these guys really knew how to put on a show. They played mainly their biggest hits including “Barbara Ann,” “I Get Around,” “Kokomo,” “Little Deuce Coupe” and “Surfin’ Safari.” They also played a new song entitled “That’s Why God Made the Radio,” from their newest album of the same name released earlier this year. Even with a collective age of 69, their harmonies blended so beautifully, it would’ve made any teen boy band jealous. During “Be True to Your School,” school pictures of the Beach Boys flashed on the big screen. Yearbook and sports-team photos really revealed just how long these men have been doing what they do. And though they can still rock, their ages do show. Brian Wilson, perhaps the most infamous member of the band due to his drug- and mental-health problems, spent the majority of the show sitting down at his keyboard. Despite this, the Beach Boys were able to put on a show that appealed to everyone in the audience. Middle-age couples sang and swayed to the music while toddlers bounced and danced to the beat. During their last song, “Surfin’ USA,” entire sections of LaVell Edwards Stadium were unabashedly dancing to the music. The night culminated in a giant fireworks display, initially set to the music of the James Bond movies and finishing in renditions of patriotic ballads. Audible gasps and “wows” could be heard over the sonic boom of the pyrotechnic display. 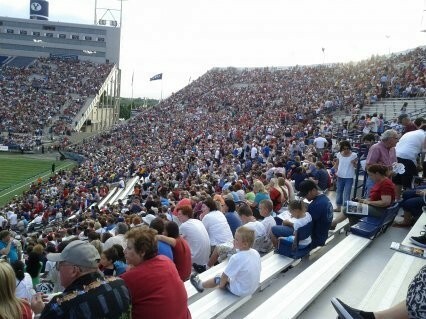 Between the Beach Boys, the talent competition and the fireworks, the Stadium of Fire offered one of the best ways to celebrate American Independence.